The world’s a mess. We may argue on the why and who, but no one is pleased with our state of affairs. Some ask how a good God can allow young children to be trafficked? Flooding muddy waters wash away villages full of people in Peru? Radiation from Japan not only wreak havoc there, but spread across the Pacific Ocean? Terrorists haunt major cities, even whole countries. Why the innocent suffer and the selfish and entitled seem to get more power, more wealth? 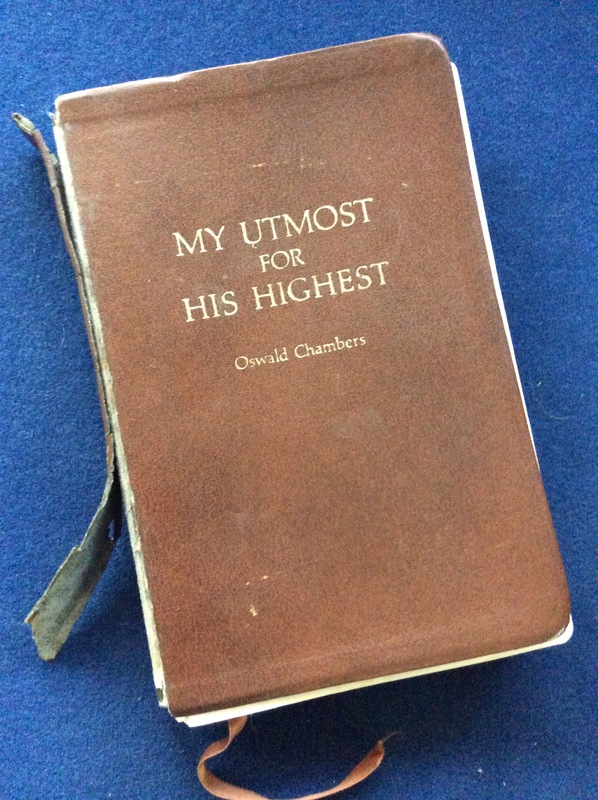 After I got my driver’s license, my Mom read to me from My Utmost for His Highest by Oswald Chambers while I drove to school. When I moved into the dorm at the U of Houston she gave me my own copy. Through the years she sent new ones as I wore them out. Right now, my OM and I read from the last one she gave us, even though he has to hold it together to read. What’s the draw for me with Oswald Chambers’ writing? Wisdom so deep you never see the bottom. So right you don’t argue, even if it flips you or turns you in your tracks. Here’s an excerpt from a devo on prayer by Oswald (as he’s affectionately known by those who love his writing) on YouVersion. Prayer alters a man on the inside, alters his mind and his attitude to things. The point of praying is not that we get things from God, but that we learn by prayer to detect the difference between God’s order and God’s permissive will. God’s order is—no pain, no sickness, no devil, no war, no sin; His permissive will is all these things. What a man needs to do is to get hold of God’s order in the kingdom on the inside, and then he will begin to see how to handle the riddle of the universe on the outside. God has so constituted things that prayer on the basis of redemption alters the way a man looks at things. Reflection Question: What might happen if I spent more time allowing God to change me and less time trying to change my circumstances? I don’t begin to understand the permissive will of God. The only part I can grasp is, I’m still alive because of it. He didn’t wipe me off the face of the earth the first time I did something not worthy of life. But there is no peace in that, alone. I’d always be wondering when I’d cross the line, when he’d say, “Enough!” and snuff me out. Through Jesus, the way God reveals himself completely to the world, I intersect with God’s order, the kind prophesied in Revelations, where there is no more death and no more tears. No more cruelty, abuse, or broken people. No more sickness of mind or body, or spirit. Because of his death and resurrection, I get a taste of God’s order now, and a promise of it forever. Until I graduate and join my sweet mama in heaven, I straddle life on one side in a world run amok, in God’s permissive will, and on the other side the inner peace His presence brings, internal order, the all-is-well and all will be well of His spirit. There is plenty I care about, much that I’m concerned about, people I ache for. But when I pray I’m not giving God a to-do list, or explaining how important something is and how, or why, he should act. I am opening my mind to the Creator, to the power of his spirit to untangle my mind and smooth my peace. Then I know how to pray for the sick and the hurting, how to react to ugliness and brokenness, how to take the next step. How to live is an upside down world. Jane, I had read and studied that Oswald Chambers passage just last week! How did it hit you?